We had a visit from the NSPCC who told us about the wonderful work that they do in supporting children who have no one else to turn to. They also told us how to keep ourselves safe and who to turn to if we do not feel safe. We were introduced to Childline and all the wonderful work that it does. We decided to raise money to help Childline continue to be there for vulnerable chidren. So our sponsor event led us to dancing in 'Onesies', runnning around, jumping and hopping in order to raise money. We are so pleased that we manged to raise £1239.09 in one week. 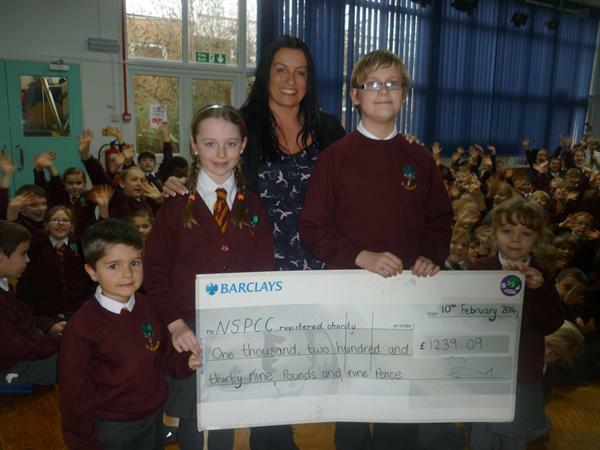 See the picture of us giviing the check over to a very happy representative of the NSPCC.